Guy Kawasaki states this fact quite openly, but the worst part about that statistic is not that 95% are bad, it's that you're reading this and you're nodding your head in agreement! What if 95% of the food you ate was bad, or 95% of all doctor advice was bad? The business world should realise that this IS NOT OK! 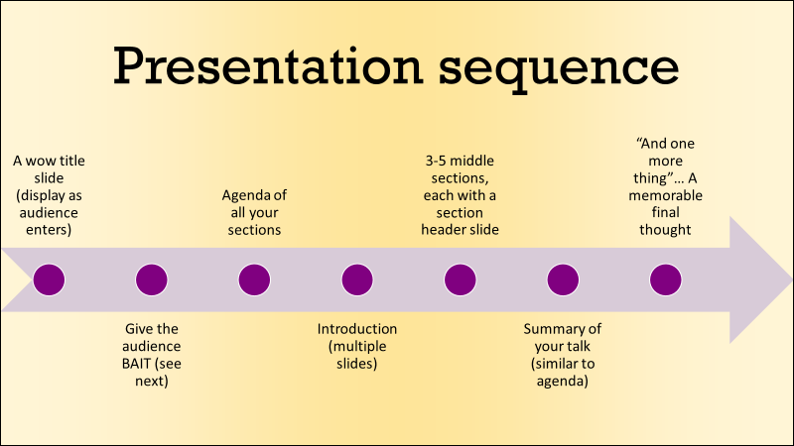 Here are some common myths about presenting. If I don't all the information my audience won't believe me: If there are 8 words on a slide I read 8 words, if there are 40 words I read 0. Good presenters can just "wing it": Everyone needs practice, if you talk regularly though you might need less practice to show a good impact. My audience will remember everything: Everyone knows this isn't true, but the way they structure their talk doesn't imply this. Choose one or two things you want your audience to remember & emphasise. I'll start preparing by opening PowerPoint: Starting in PowerPoint is like if you get in the car drive and assume you'll eventually get to Australia! Images don't add much: In a study done 72 hours after, people remembered 10% of what what was said and 64% of what was said WITH a relevant image! If I use images, I'll forget what I should say: The opposite is actually true, humans absorb images 60,000 times faster than text, so as a presenter an image will be a much better cue for what to remember than text. Most are skeptical so I actually showcase a live example of this in my workshops! B anter: Not a joke per se, but a something humorous, like a funny comment about your audience or a hilarious gif/image on screen. Have you ever been with a group of friends and your mind has wandered off, but other start laughing and you want to ask what the joke you missed was? Listening to a laugh makes your brain more present so it works similarly in presentations. A necdote: Say a short human story (it can be your own or someone else's, but make it human (with images of people on slides). Humans have been storytelling for millennia, it evokes emotion, and suspense makes people needing to listen longer than they otherwise would. I nteraction: Just like banter, this draws wandering audience brains back to the present. "I've been asked to do something now". I normally use a very simple one: "Hands up if...". It's very easy for even the laziest audience members to respond. E.g. if you're talking about why your new Smart Phone is awesome you can start by asking "Hands up if you get frustrated by poor battery life on your phone?" Most will put their hands up, and everyone who does is now invested in listening to your talk! Be careful with asking your audience to shout out answers - unless you have allocated discussion time, only use closed questions, maybe even with multiple choice on the screen to assist them. T rivia: Give one single WOW statistic or fact. Many talks start off with "My company is in X countries, we have been selling Y products for Z years". Who cares? No one, choose one interesting fact and spend time explaining why it's such a WOW fact like "88% of Spreadsheets have errors in them"
If you want your audience to listen to more of your talk, BAIT should be used at the start it but can also be used at intervals for when your audience might get distracted or when emphasising a key point. I normally use a combination of all four and every 5 minutes or so I will start fishing again, and make sure as many audience members as possible go for the BAIT!